The L place is becoming quite the hip and happening spot, with Cantopop on ground level, Linguini Fini on the first and Shore sprawling over the third and fourth floors. The first time I had a meal at Shore, was when its doors opened back in October last year. Though the ambience was pleasing, the decor swish and modern, and the space vast, I was distinctly underwhelmed by the whole experience, not least because the best item on the menu at the time was the chunky cut chips. However, after giving it a wide berth, (a year in fact), to settle in and iron out its kinks, I gave it another shot and this time I left with more than the chips on my mind. The girls at Sassy have organised a very fun and successful Sassy Hour at Shore before, and while many people flock to the third floor for their popular Happy Hour to have laid-back al fresco cocktails on the terrace, it turns out that most seem to be unaware of the restaurant. Perhaps, back at its inception, this was a good thing, but now I can safely say that things are on the up, upstairs. One aspect of this restaurant that I do admire is the decoration. Taking full advantage of the ridiculous 10,000 sq ft split-level space, Kinney Chan, the designer, has used natural earth tones and soft contours for the ‘Onshore’ fine dining restaurant, and sea hues and coral effects for the ‘underwater’ bar downstairs. It’s all rather soothing and relaxing. 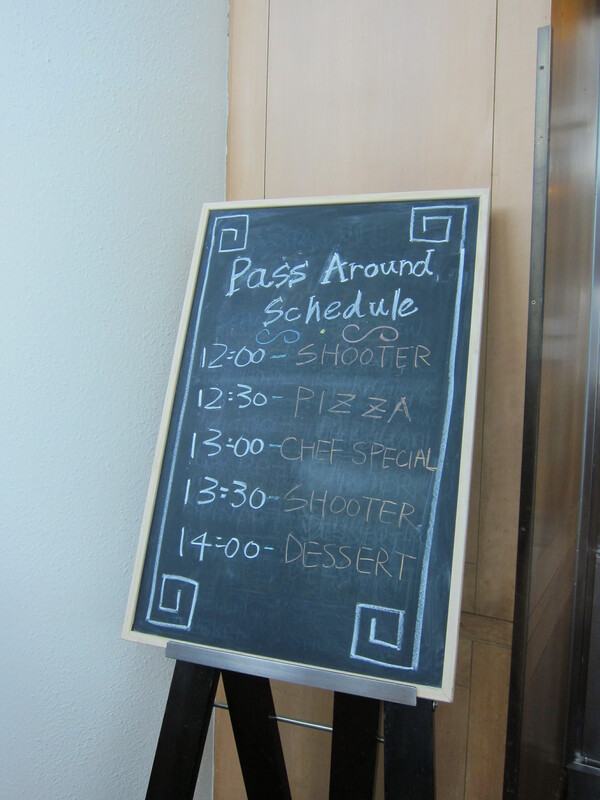 The menu has been given a ‘reboot’ and now the open kitchen churns out a wide variety of Western fare. 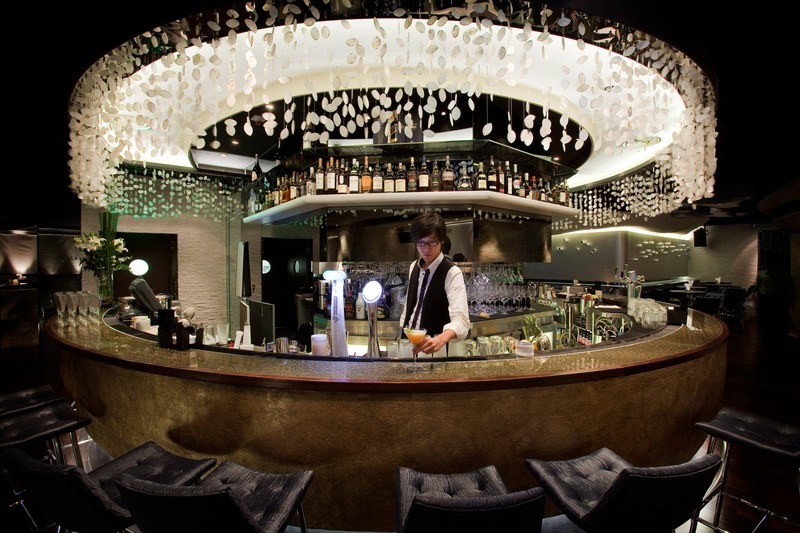 Their main area of focus is their dry-aged “meat on the bone” from Australia, and prime cuts from the USA and Canada and they also have a selection of seafood specialities in keeping with their ‘Offshore’ concept. 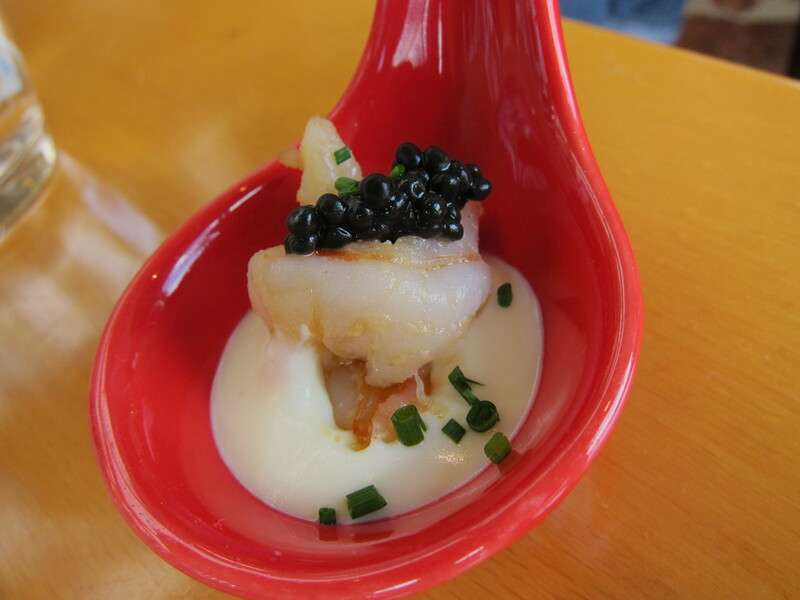 I had a bit of a feast as usual, starting with the humble but excellent Prawn cocktail with classic Marie Rose sauce, (posh name for ketchanaise). 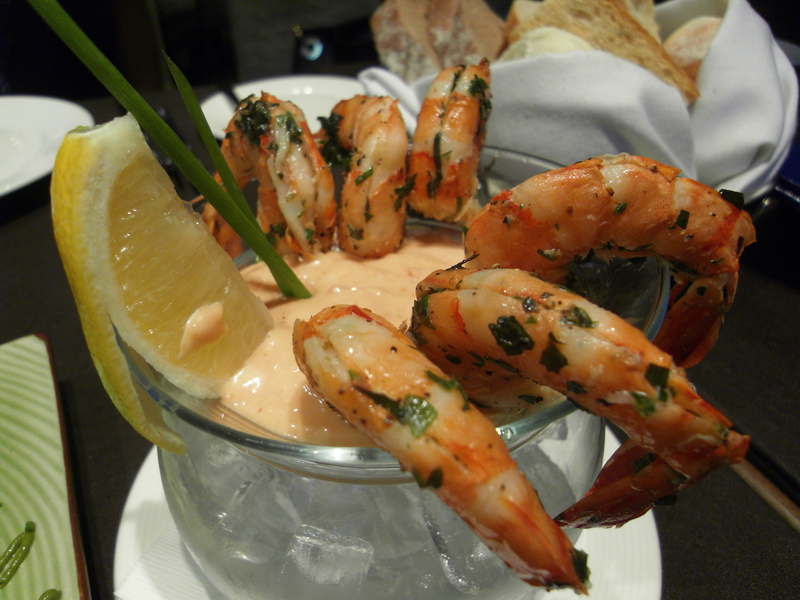 The Australian prawns were large, succulent and nicely seasoned and the sauce was at its tangy best. 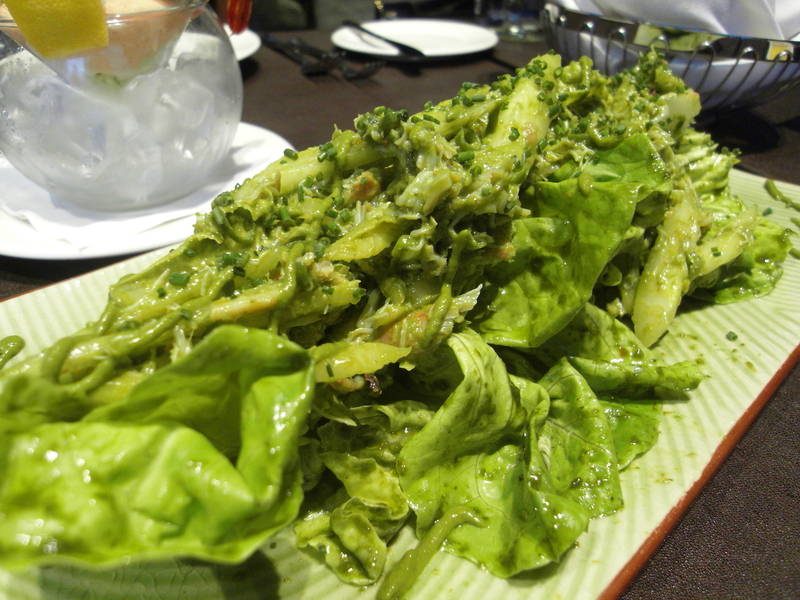 Next, I sampled the Baby Butter Lettuce Hearts salad with fresh crab, avocado, spring onions and cucumber with a wonderfully refreshing dressing. The presentation was alarmingly green; it was practically screaming, “I’M FRESH! 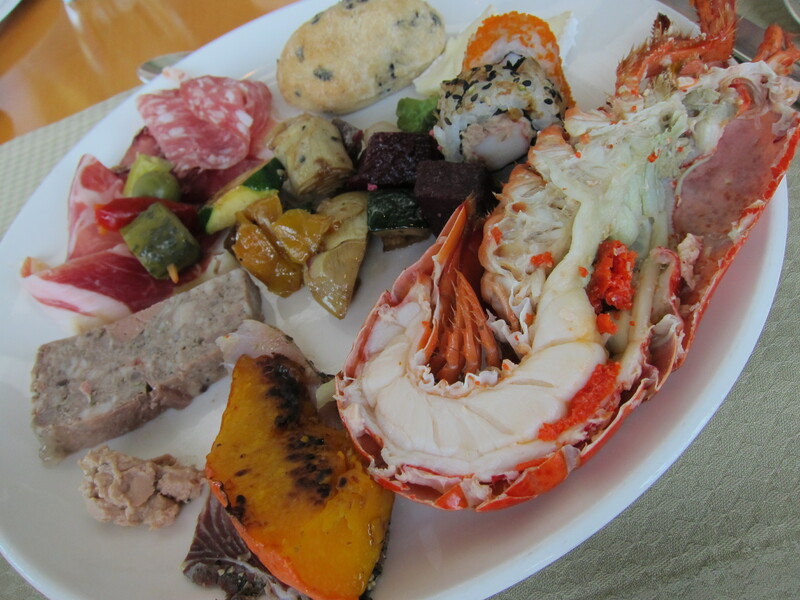 !” Luckily for Shore, it was, and one of the better salads I’ve had in a restaurant for a while. 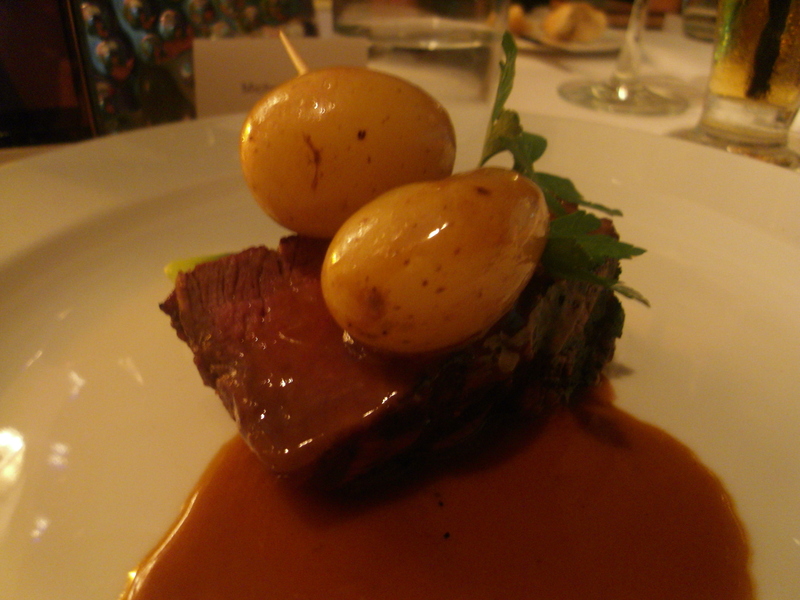 For mains, I had to try a steak of course. 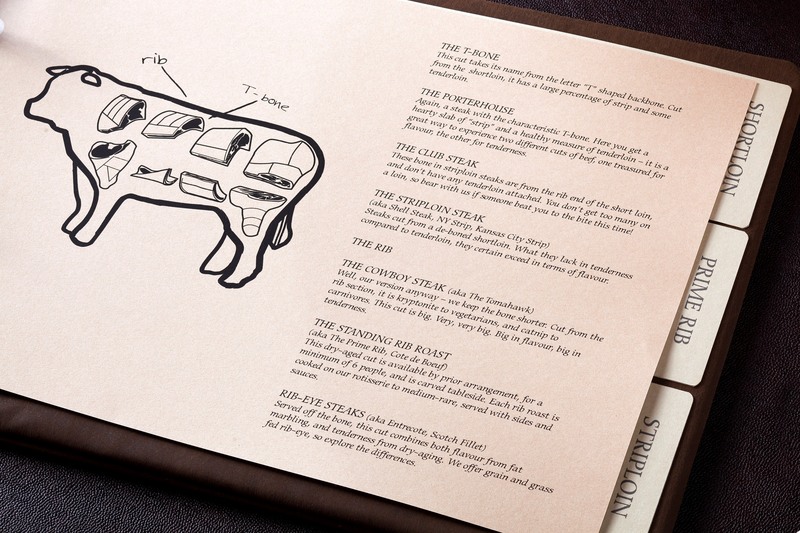 For the steak-clueless, they have the ominously titled “Meat Bible” for you to read and digest before you pick your cut. It’s actually not a huge read, but it is educational and comes with pictures, which always helps. I had the 12oz all natural grain fed USA Prime Rib-eye steak from Cedar Farms, USA. It was huge and even though I only had half, (I shared with my companion thankfully), I still had a touch of the meat-sweats afterwards. The steak was well-prepared, the meat of a high quality, but didn’t set itself apart from its counterparts in other establishments. Overall it was a solid effort, and yet again, the chips were great. Dessert is a different story. The menu has two sections- the ‘Choco Block’ and the ‘Not-so Choco Block’. In other words, chocolatey treats and non chocolate treats. I had the “very sorry task” of having their 9 layer chocolate cake, a task that I was extremely reluctant to undertake, as I didn’t want to create food envy when I then proceeded to post a photo of it on Twitter. It’s positively sinful. 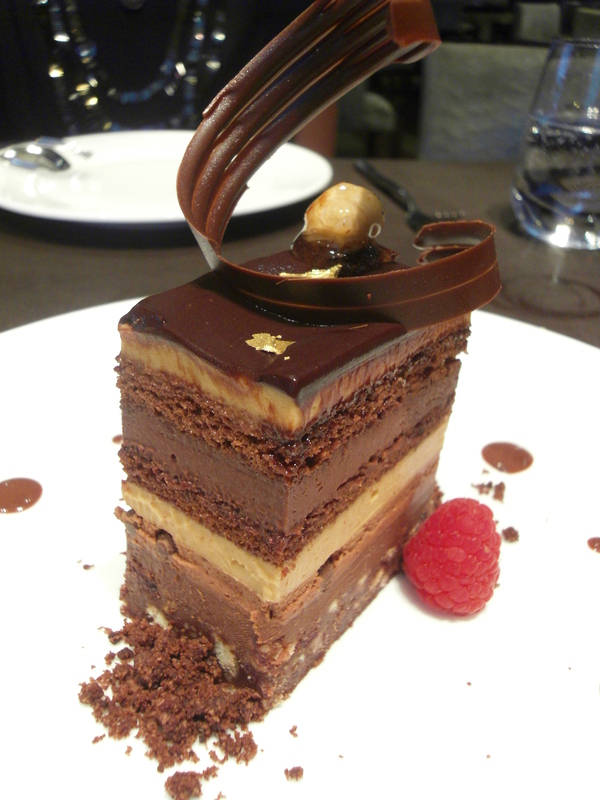 Chocolate sponge, ganache and praline buttercream elegantly layered and presented teasingly on a plate before me. How’s a girl supposed to say no to that? I’m not going to comment as I think you can probably guess what I thought of it. 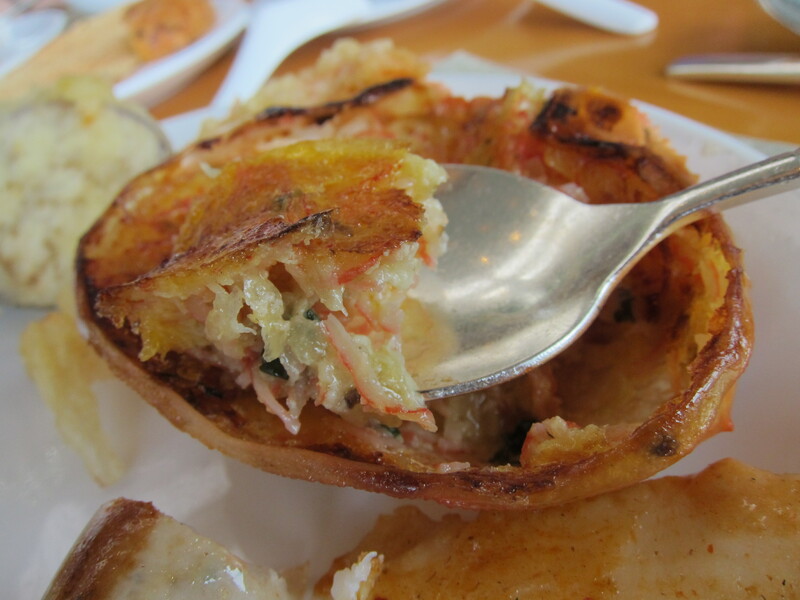 I’ll let your taste-buds decide for themselves when you pay Shore a visit. 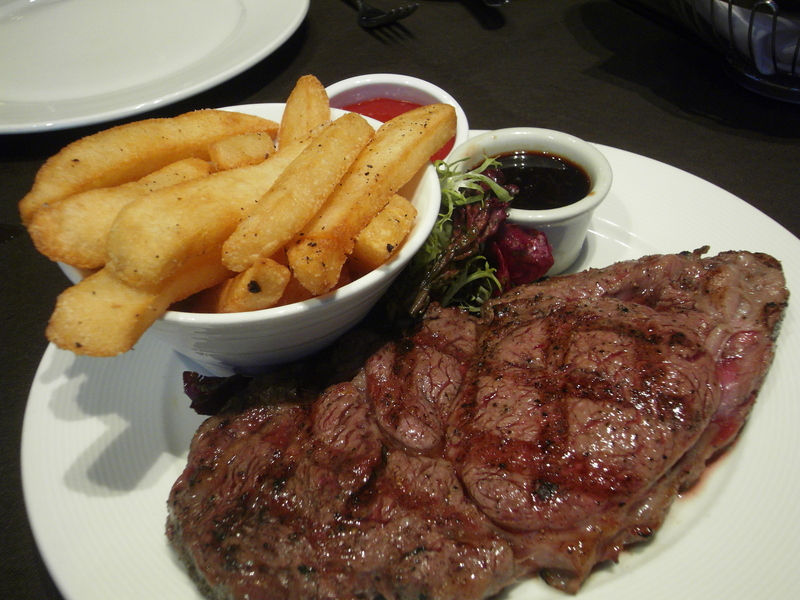 Categories: International | Tags: Cedar Farms USA, dry-aged meat on the bone, Hong Kong, natural grain fed USA Prime RIb, Queen's Road Central, Shore cocktails, Shore Hong Kong, The L Place | Permalink. I love that I’m so near the sea in Hong Kong, and one of the best things about it is some of the stunning views, one of the most famous being that of Victoria Harbour. There’s nothing like watching the sunset between the skyscrapers and the reflections bouncing off the water, as you journey back from a junk trip or take the Star Ferry. 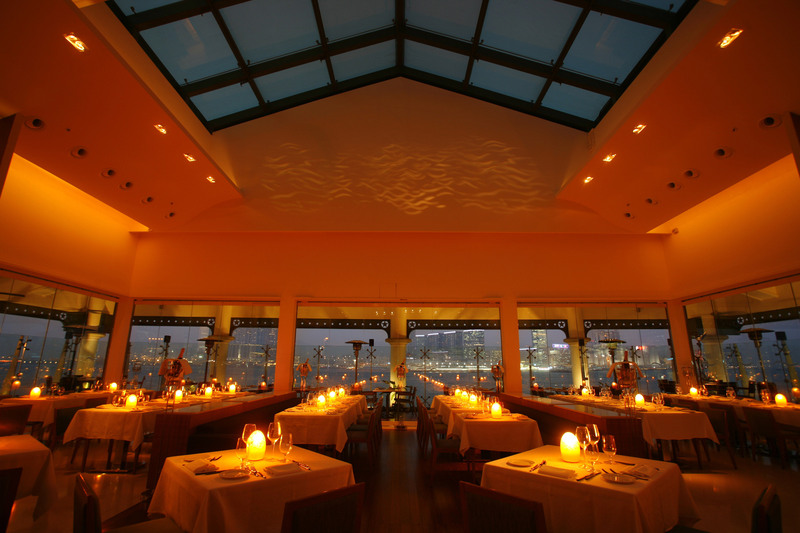 The Watermark offers a great waterfront dining experience, especially as it has nabbed a prime location at Central Pier. You’ll spot couples enjoying a romantic meal while taking in the 270 degree view of the harbour or groups of friends having a laugh over a chilled bottle of wine, as they see boats pass by. Having never eaten there before, I was taken by the capaciousness of the restaurant, with its high ceilings and open-plan design, yet there is an intimacy to the ambience. I attribute this to the partitioning of the huge glass windows, which break up the views a bit, but still give diners a spectacular view of harbour activity. Last month I was delighted to be invited to an eight-course tasting dinner to sample Executive Chef Pascal Breant’s rejuvenated contemporary continental menu. 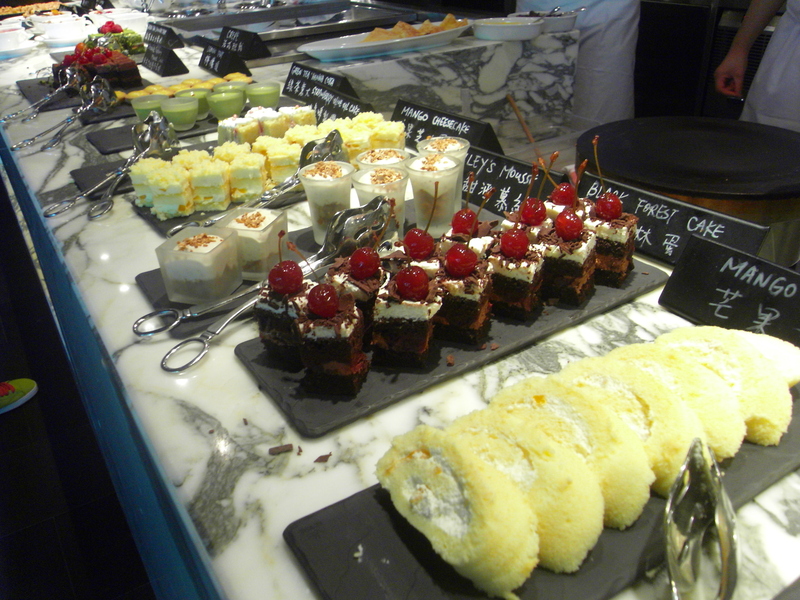 Armed with an empty stomach and a big appetite, I happily grazed my way through five appetisers, two mains (albeit, reduced in size) and a fantastic selection of Artisan cheese and house petit fours. 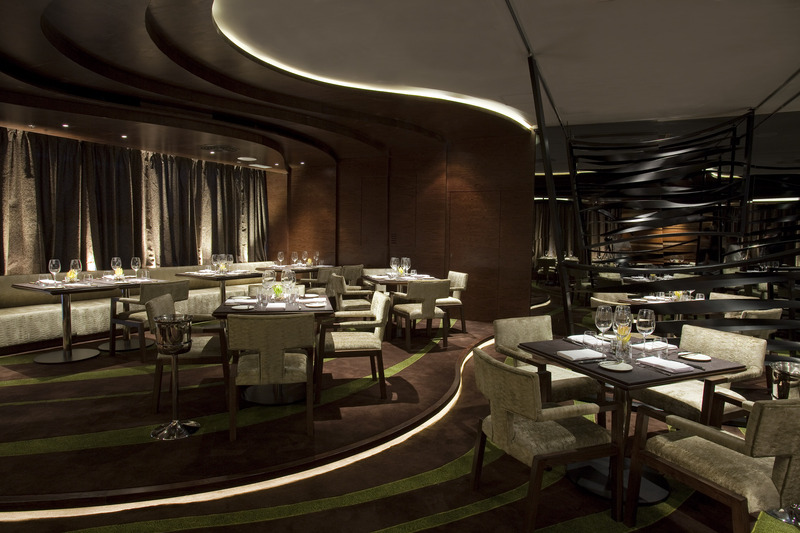 Watermark prides itself on its dry-aged beef, the beef undergoing a dry-ageing process to tenderise the meat and concentrate the flavours and flies in a variety of fresh seafood every week for diners to enjoy. 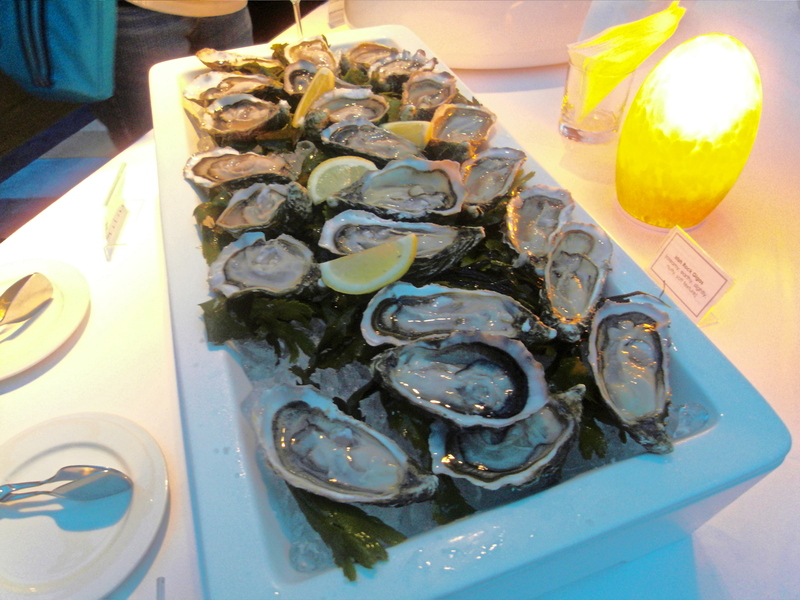 To start, the others guests and I were greeted by three of the biggest displays of oysters I’ve ever seen. 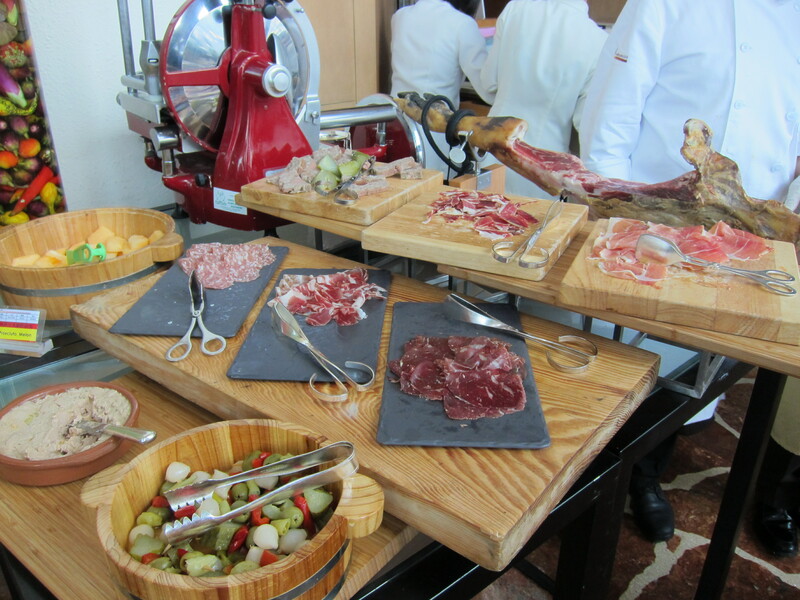 We sampled the Irish Rock Gigas, which was nutty in flavour and soft in texture, the Tasmanian, which was creamy and saltier and my favourite, the French Pinky which was extremely flavoursome and meaty. 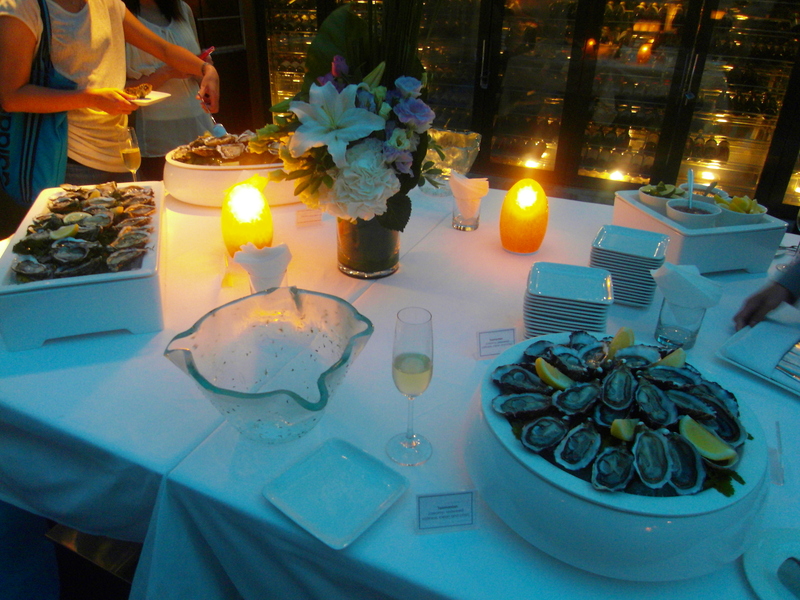 I had to walk away and substitute eating for drinking champagne instead, to prevent myself from gorging on piles of oysters. 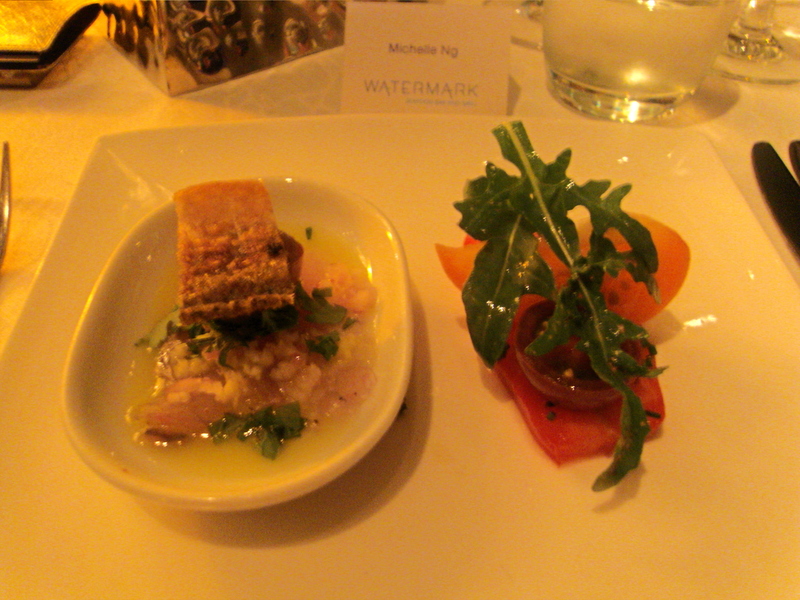 When we were seated, we were first given the Barramundi carpaccio paired with Heirloom tomato and field greens. 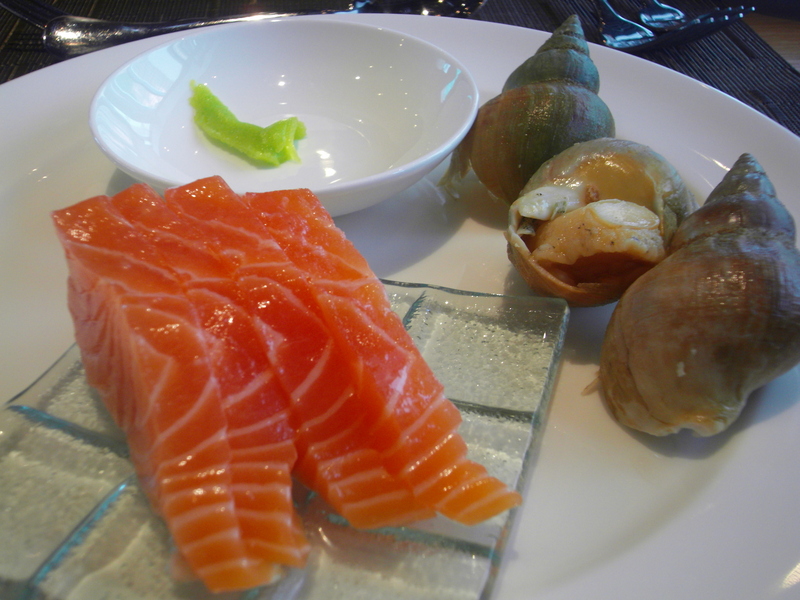 The carpaccio was very fresh and not too fishy due to the neutralisation of the shallot, ginger and lime dressing. 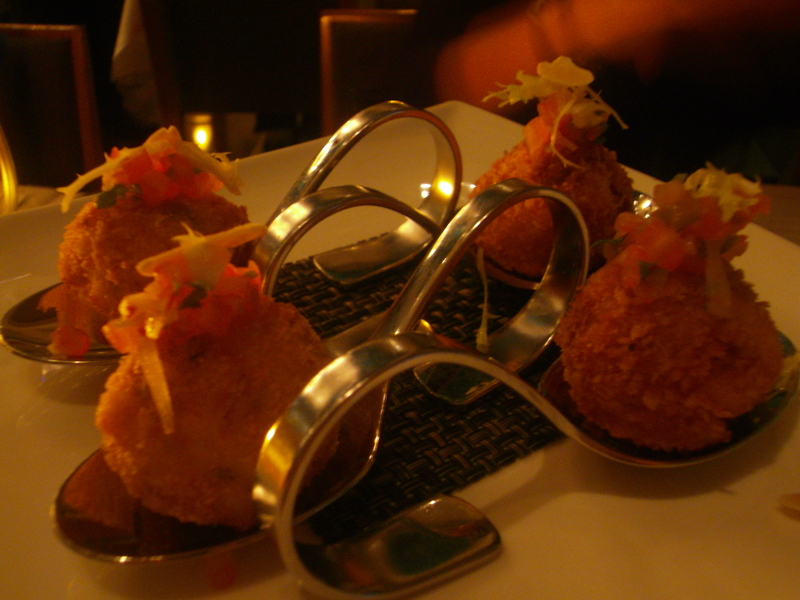 Next was the crispy jumbo lump crab cake, a deliciously huge lump of crab served with a great jalapeno salsa and the seared foie gras with poached pear which was perfectly cooked. Another new creation is the white bean cappuccino with pork sausage. 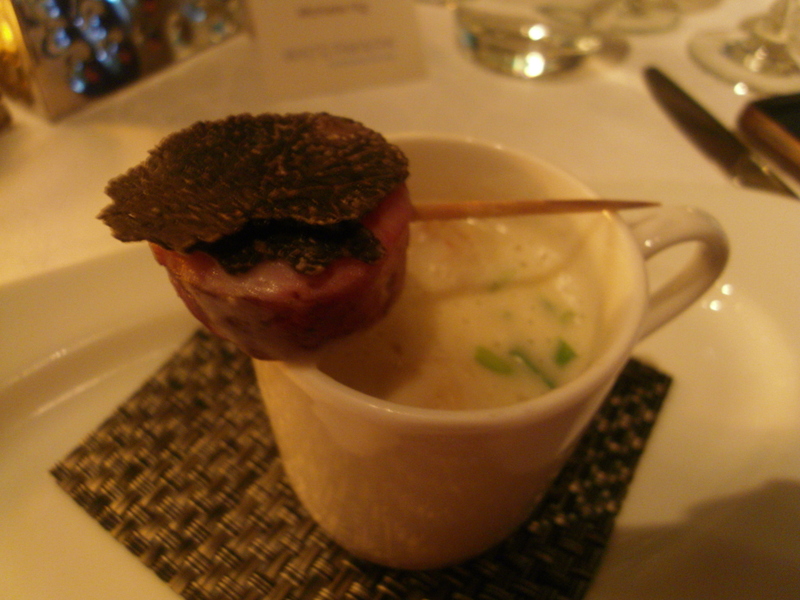 The presentation appealed to all the girls- a tiny white cup of the frothy creamy cappuccino soup with a slice of sausage on a cocktail stick perched on top. If you think your balance is off at the restaurant, don’t panic. At one point I thought my one glass of champers had affected me badly as I kept swaying at the table, until I realised that several boats were passing by and were causing ripples of movement on the pier! Of the two mains- the pan seared wild seabass and the French tenderloin with fondant potato, the seabass was the highpoint. 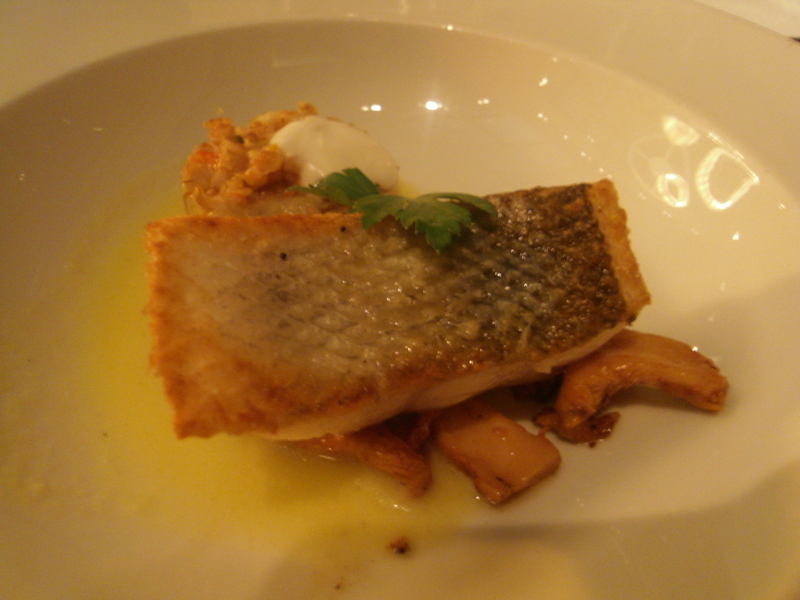 The fish was beautifully prepared and seasoned and I loved the bulgur wheat and mushroom fricassee. My tenderloin steak was cooked just right, the seasoning was great, but compared to the fish, and other steaks I’ve had, it was at most, good. 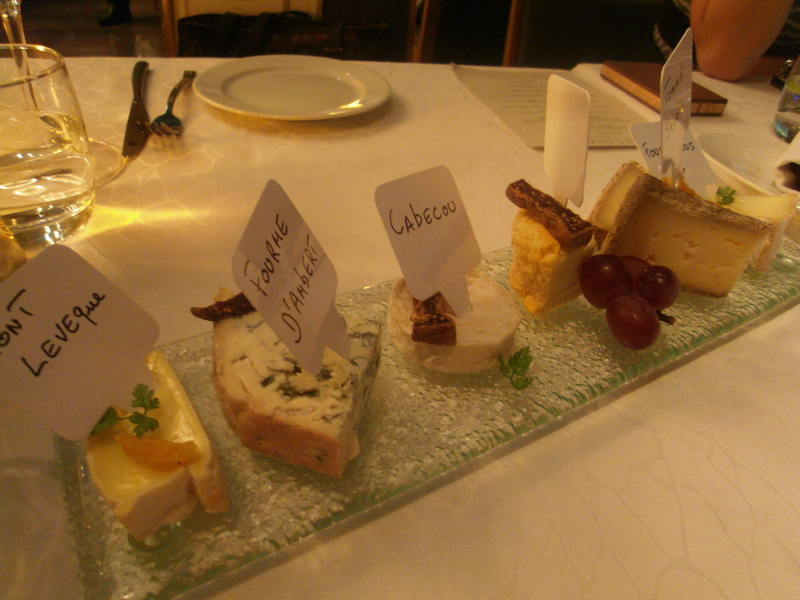 I adored the Artisan cheese platter. 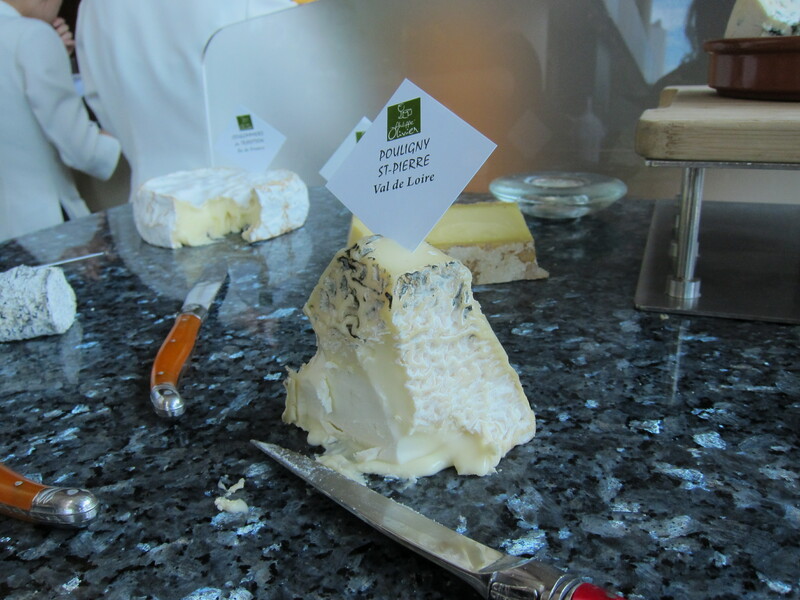 The selection included Pont-l’Évêque, Fourme D’Ambert and Cabécou cheeses. I could’ve eaten the entire tray. Thankfully three others were sharing with me, otherwise several moments on the lips would’ve become several lifetimes on the hips. 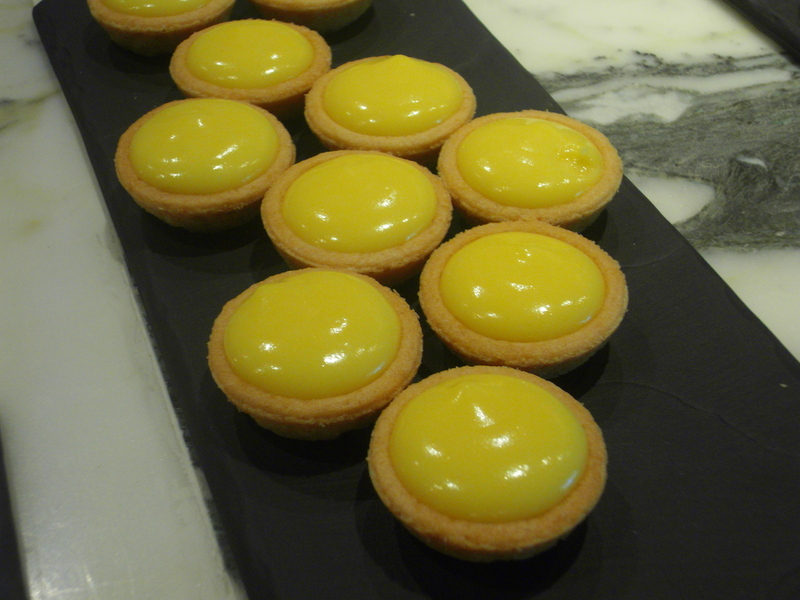 The petit fours were lovely, but by then I was too full to fully appreciate the tiny chocolate gateaux, pastries and custard tarts. I did squeeze in the world’s smallest strawberry ice-cream cone to end an evening by the harbour. 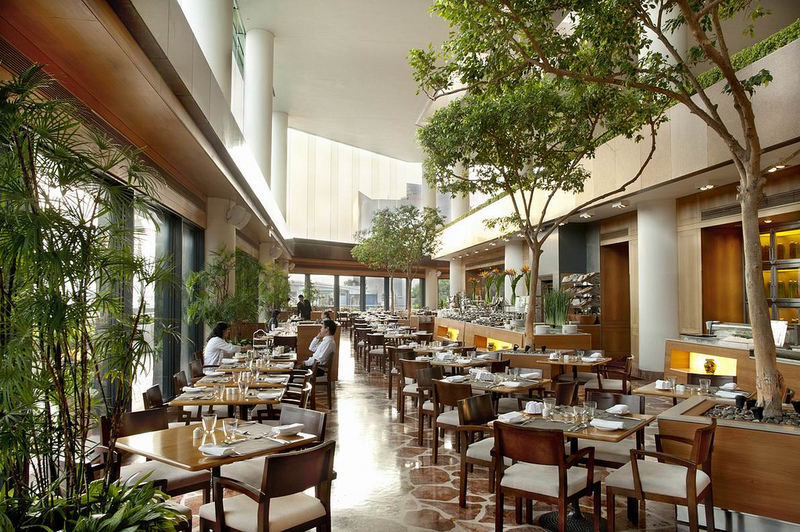 If you’re stuck on ideas on where to go for a date, a special occasion or even Sunday brunch, Watermark hits the spot with its ideal location, charming views and elegant menu. Categories: International | Tags: Central Hong Kong, Star Ferry, Victoria Harbour, Watermark | Permalink. I recently found myself taking an epic walk from Tsim Sha Tsui MTR to East Tsim Sha Tsui, and wondering why the government didn’t just make one very, very long travelator from one end to the other. I’m a little lazy sometimes and especially so when I’m investigating eateries in never-before-explored areas, such as East TST. There’s something mysterious about the ‘East’ side, no-one really mentions it, no-one wants to go there, as according to some people, it’s “enough of a trek going to TST, let alone East TST”. But, there appears to be a fair amount to do around there, lots of malls, markets, restaurants and a shed-load of hotels everywhere you look. Worth a closer inspection I say. On this particular day, I was going to the new Hotel ICON, (opened since May), which aims to combine traditional and modern Asian hospitality with local and international art and design. It’s very funky inside and I can imagine, as a guest, a bit like staying in a piece of art. 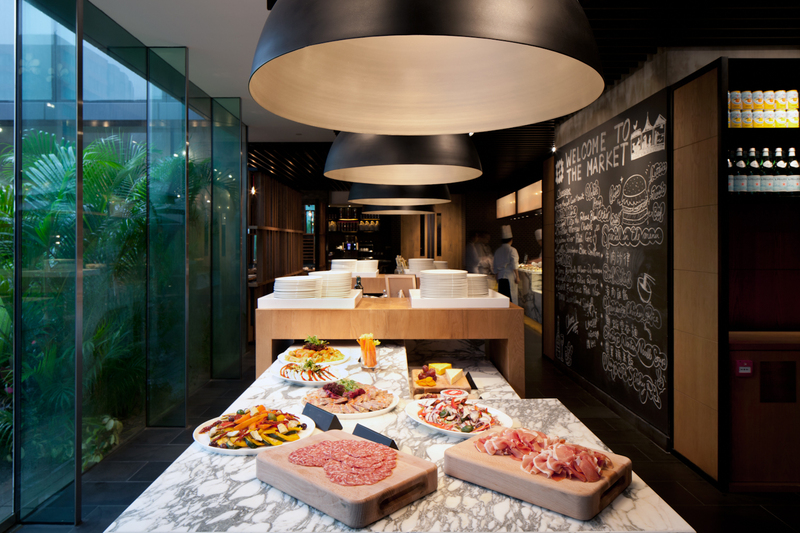 There are three restaurants in Hotel ICON, all designed by Terence Conran: GREEN- a café and tapas bar, Above & Beyond- which serves Cantonese cuisine and The Market. 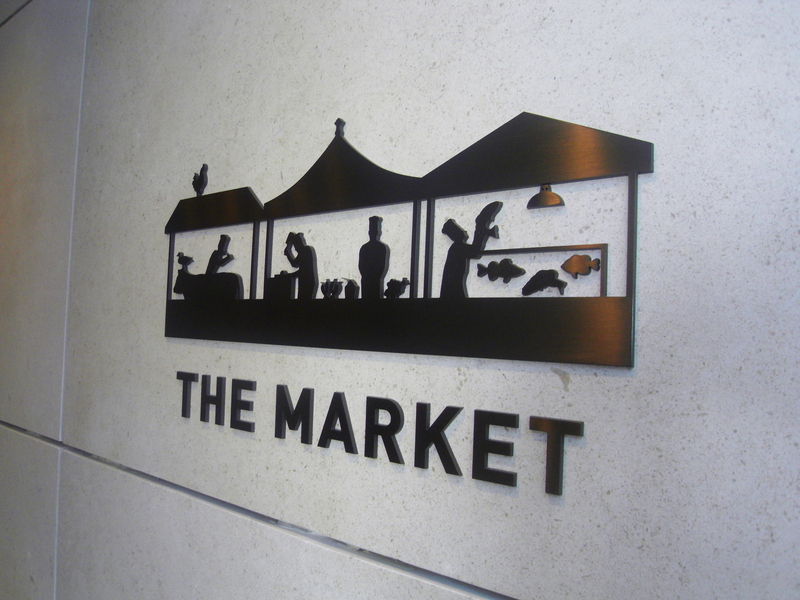 I was trying out The Market, which, barely 2 months into its opening, is already heaving with customers. 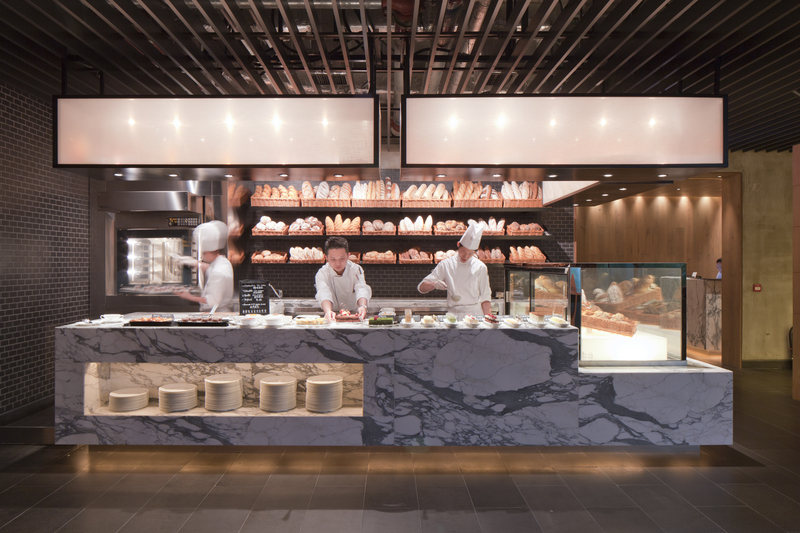 A buffet-style restaurant offering mostly Asian but also international dishes, it claims inspiration from Hong Kong’s wet markets, with open kitchens and chefs cooking everything from pizza to tandoori chicken. 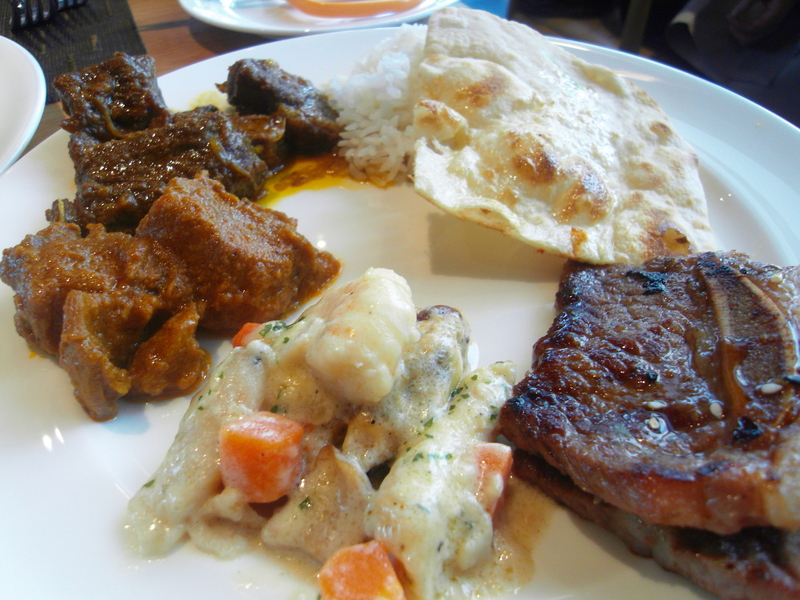 It has a few signature dishes, two of which are the Laksa Lemak and the Beef Rendang. 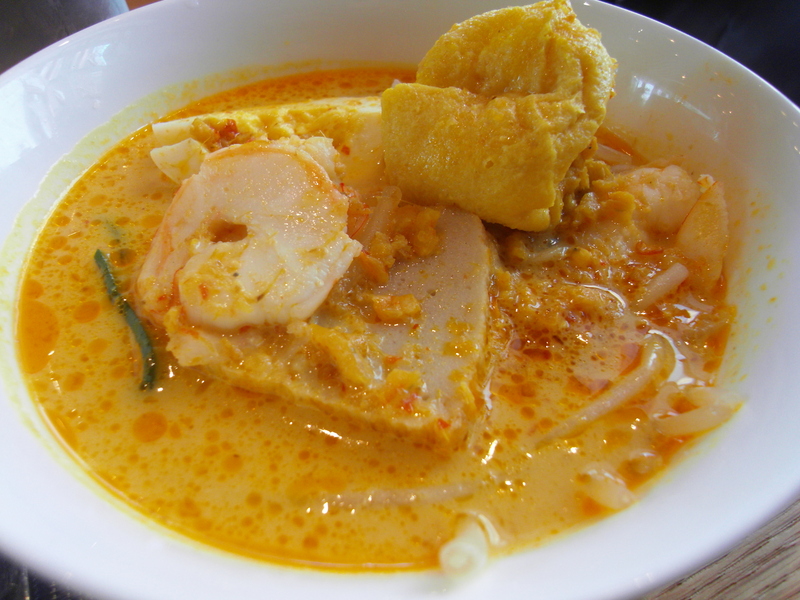 My family is originally from Malaysia so I know how these should taste, and they were good, especially the laksa soup, which anyone will tell you is the most important part of the entire ensemble of ingredients. 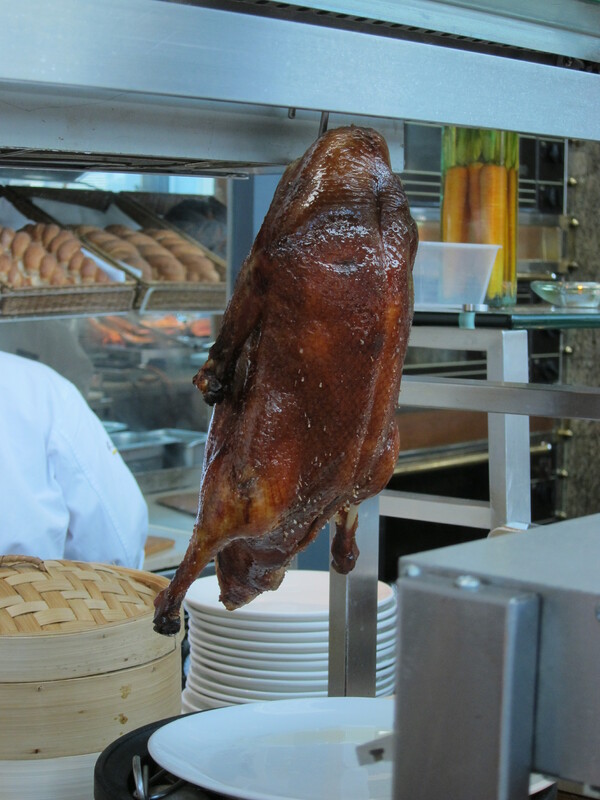 Obviously it helps that Hotel ICON has employed a Singaporean chef to cook these classic dishes! 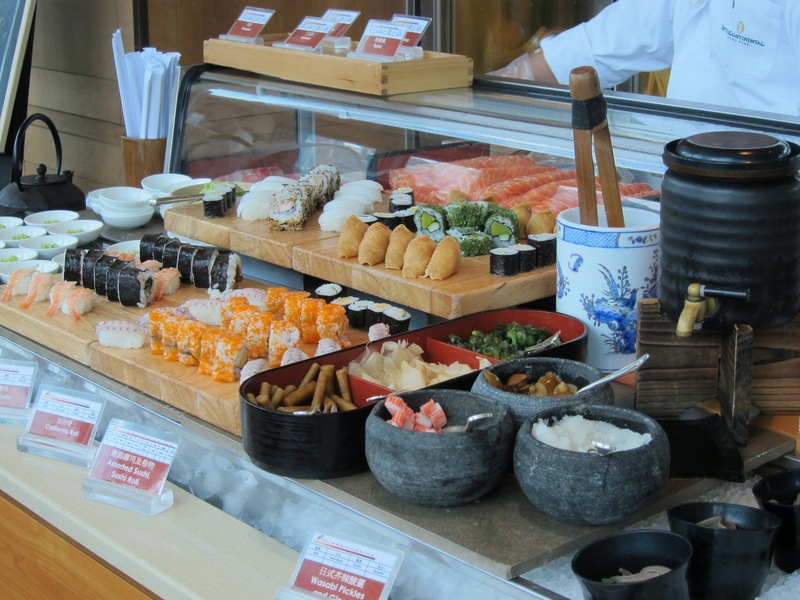 Apart from the noodle/ congee section where the Singaporean Chef resides, there is also a tandoor oven, a regular oven for roasts, a Japanese, Korean, and Chinese section, as well as an ice-kacang corner, a self-service pancake machine (!) 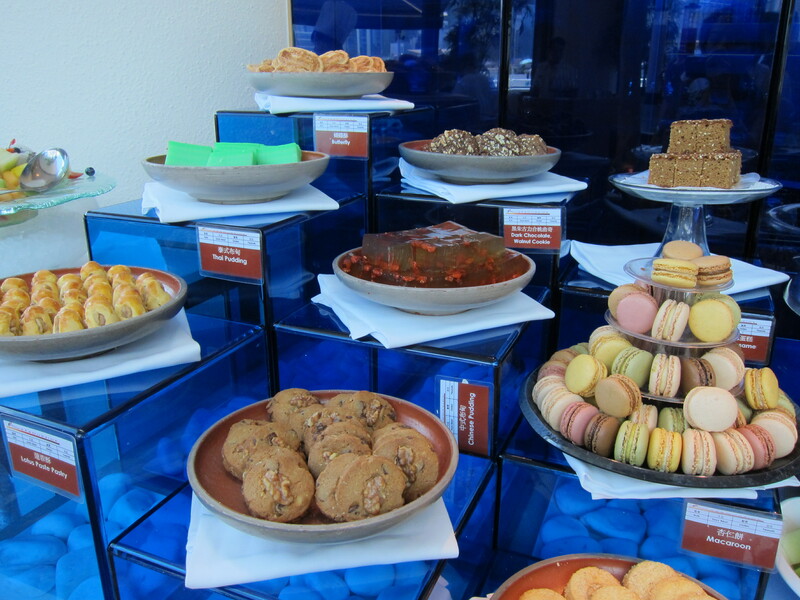 and a brilliant pastry and dessert section, presided over by pastry chef Danny Ho, who seems to be something of a genius with sugar. Before I swoon over the desserts, one thing I need to mention is how tender all of the meat was. I had a selection of Western-style roast beef and pork and Korean-style grilled beef and pork which were very succulent and juicy. The sashimi from the Japanese corner was of a high quality, though a bit too thickly sliced for my taste and the curry sauces generously thick and full of flavour. 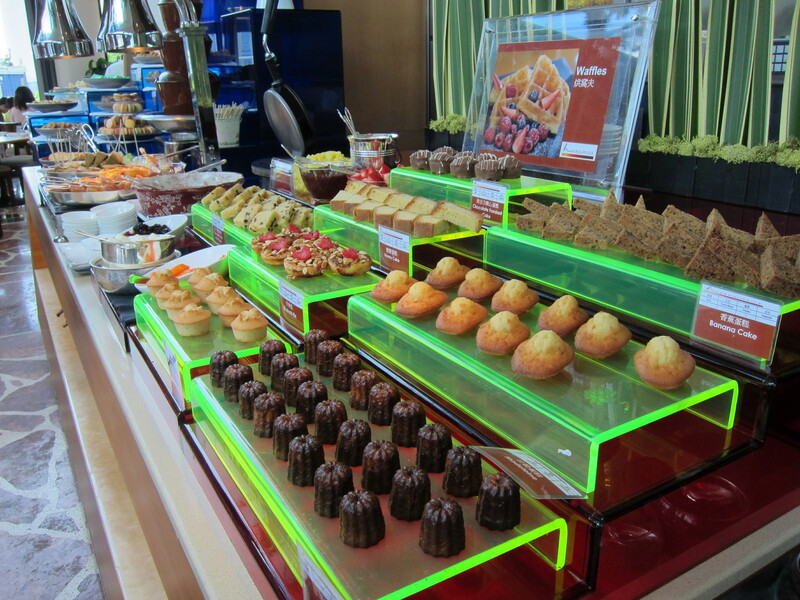 But back to desserts, and what a selection there is on offer! 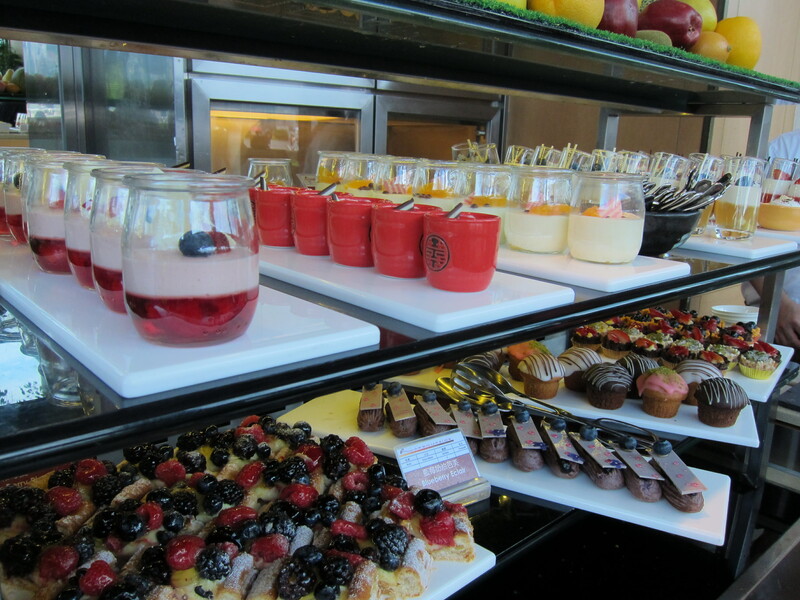 Chef Danny Ho has managed to make the entire dessert section so pretty with its display of mini cakes and puddings that it looks too good to eat. 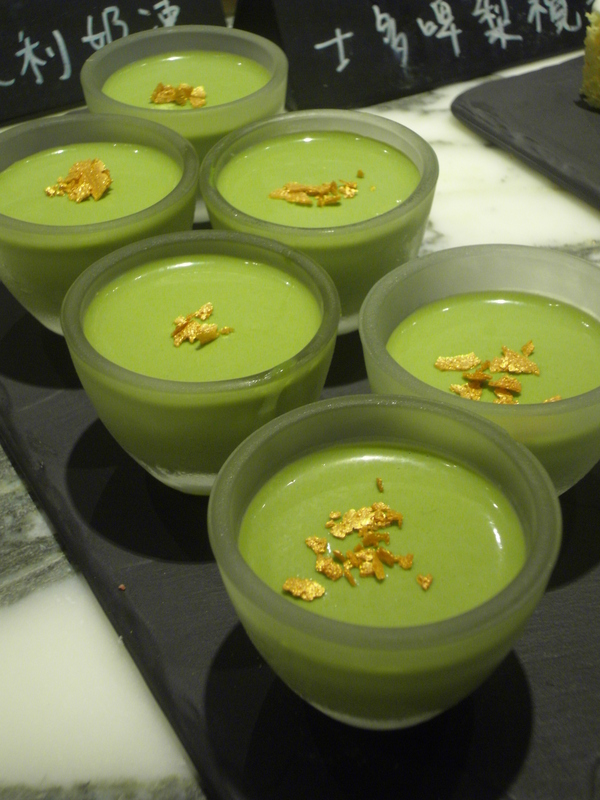 One delectable pudding that stood out for me was his vegetable sorbet. I see you frown at this, but this sorbet made from a blend of cucumbers, tomatoes, strawberries and red peppers, is a sublimely refreshing and moreish palate cleanser, and the best way to end a rich meal. I could have eaten a whole tub of it. The over-riding flavour is the strawberry, but on first taste, you detect the red pepper with a cucumber undertone, which then gives way to the sweetness of the strawberry. I wonder how he does it. 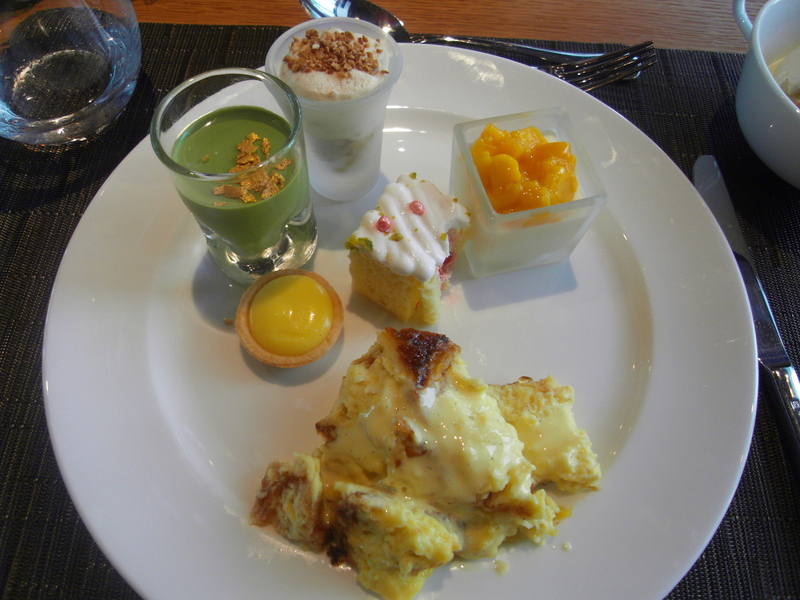 My only excuse for eating so many desserts is that they were really small, bite-size; which is why I ended up with Green tea panna-cotta, apple crumble with vanilla ice-cream, bread and butter pudding, mango panna-cotta, Baileys mousse, a lemon tart and a strawberry olive oil sponge cake. There wasn’t a single one I didn’t like, but I loved the lemon tart and the Baileys mousse was pretty strongly flavoured! None of them were too sweet, so I didn’t feel sick afterwards- always a bonus. 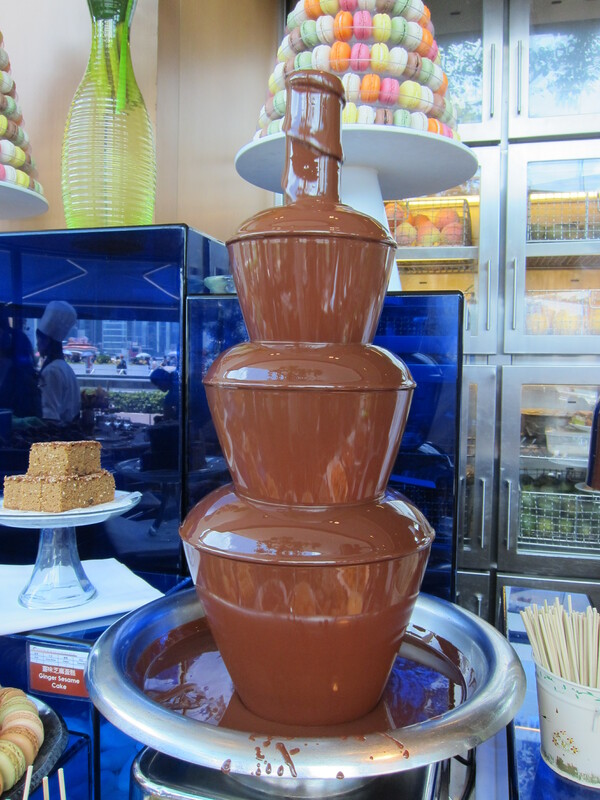 Prices start at $198 for breakfast, $218 for lunch and $408 for dinner. The selections will vary with each meal, but if the self-service pancake machine tickles your fancy, you’ll have to go along for breakfast. Don’t let the location put you off. 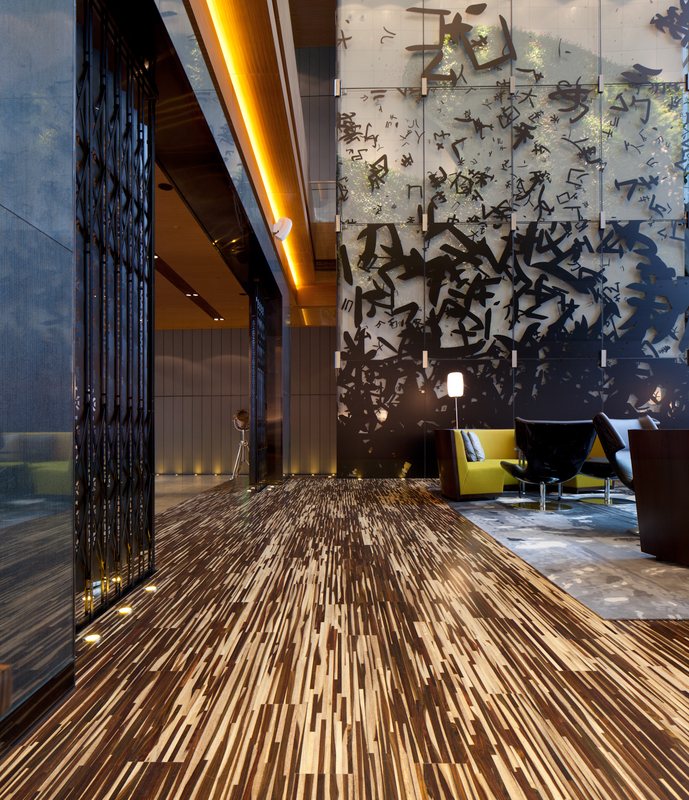 Hotel ICON is one of many places to explore in East TST. The great thing is you’ll work up an appetite getting there! You can also see this review at Sassy HK. 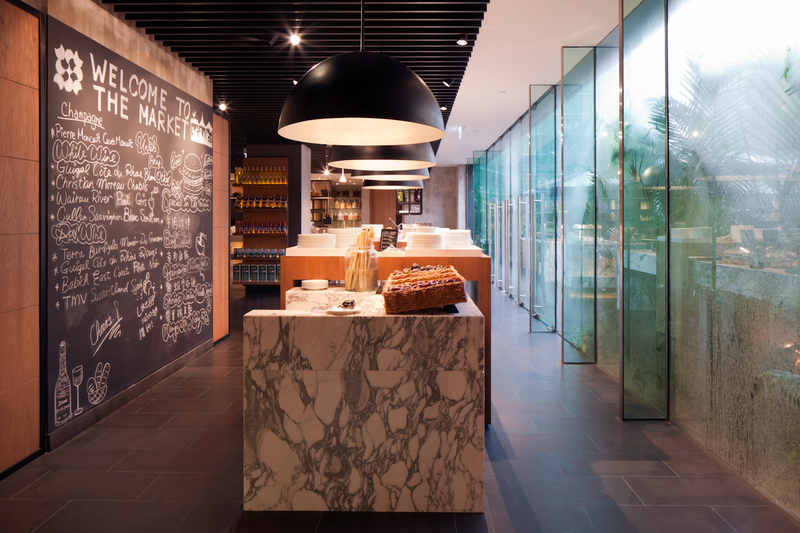 Categories: International | Tags: Chef Danny Ho, curry laksa, East Tsim Sha Tsui, East TST, Hotel ICON, Hotel Icon buffet, Terence Conran | Permalink.